We love gooey cheese dishes, bonus if we can sneak a vegetable in there like zucchini. Usually we’re not really sure what to do with zucchini besides eat it straight off grill or put it on pizza. We love putting vegetables like eggplant in risottos, stews, etc. but the zucchini somehow gets neglected. However, it’s absolutely delicious in this lasagna! This dish is healthier than traditional lasagnas thanks to the vegetables and the low fat cottage cheese. 2. Heat the olive oil in a heavy frying pan over medium heat. Saute the garlic for two minutes, then add oyster mushrooms and zucchini. Stir and cook for 8 to 10 minutes, until zucchini and mushrooms are tender. 3. Cook the noodles in boiling water for a few minutes, rinse in cold water and drain. 4. 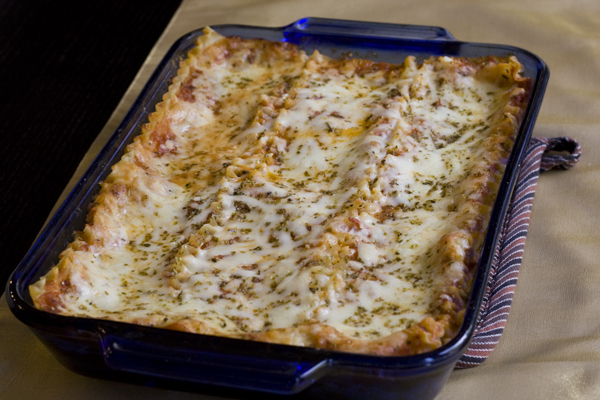 Cover the bottom of a 9×12 inch baking pan with 1/2 cup of the marinara sauce, then cover the sauce with one layer of lasagna noodles. Cover this with a thin layer of cottage cheese, then add a layer of cooked mushrooms and zucchini and a thin layer of marinara sauce. Repeat 2 times, then add a layer of noodles, a layer of marinara sauce and a layer of shredded cheese. Sprinkle oregano on top of shredded cheese. 5. Cover the baking dish with foil and bake for 30 minutes. Uncover the lasagna and bake for another 15 minutes to lightly brown the cheese. 6. Allow lasagna to sit for 10 to 15 minutes before serving.